It’s that time of year again: The dog (or cat) days of summer are behind us, and those of you with school-age children are thinking about the start of the new school year. Maybe you’re thinking that your cat will breathe a sigh of relief once the commotion of summer is replaced with a more predictable routine. However, that may not be the case. In fact, rather than relishing the solitude, chances are your cat may feel a little lonely in the all-too-quiet house. Think about it — cats are creatures of habit, and yours has probably gotten used to having people around during the summer months. As a matter of fact, he probably pre-furs it that way. Cats are social by nature and they crave our companionship — especially those in single cat families. Your kitty might not follow you from room to room or hop up in your lap every time you sit down, but (although he’d never admit it) he enjoys and needs your company. So once the kids are back in school, he could easily become bored and lonely. Here are some ways you can help him with the transition. Most cats love creature comforts, so why not get yours a cozy new place to take his catnaps while the family is away? He’ll get even more enjoyment out of it if you place it somewhere that has a view of the outdoors. My cat Olivia loves her Kitty Ball Cat Bed I found on Chewy. From here, she watches birds, squirrels, and blowing leaves from the comfort of the bedroom! Hide kitty’s kibble or treats in spots around the house to engage his hunting instinct. This will provide him with exercise, nourishment, and mental stimulation. That’s right — no need to purchase a new kitty condo! Let’s face it, most of us have about a zillion Amazon boxes piled up in the garage or stuffed in a closet. Just gather some boxes and stack them up or place them in various spots to give kitty some explore time. When the kids get home from school and you from work, don’t get so caught up in the hustle and bustle of it all that you forget your furry family member. Make sure that he gets some one-on-one attention. Do the kids have homework? Let kitty sit in their laps while they tackle their math. Do they have reading to do? Younger children can read to your cat, while older ones may prefer just to let him snuggle while they read to themselves. In addition to snuggle time, kitty may also appreciate some play time — especially if he’s spent the day napping in that nice new bed you got him! Get out a laser or feather toy and let him have a good romp. Simply switching your kitty litter can make a world of difference to your cat. My girls and I LOVE World’s Best Cat Litter™! This paw-some litter employs the concentrated power of corn and a patented process that compresses naturally absorbent corn into super-concentrated granules that give you outstanding odor control and quicker, easier cleanup. And easier cleanup for you means a cleaner litter box for kitty so everybody wins! Your cat will love it because the granules are smaller and softer than clay, so they’re more paw friendly. And since World’s Best Cat Litter™ is 100% natural, there’s no chemical scent to offend kitty’s delicate nose. But, trust me, your cat won’t be the only one purring if you make the switch! 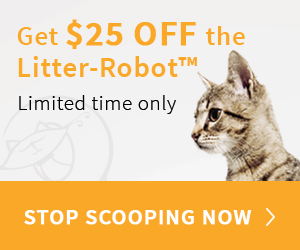 It’s lightweight and clumps really well, so your days of chiseling out the litter box are over. It’s also dust free, so the floor around the litter box stays much cleaner. It can save you money too! Because it clumps so well you end up using less — one small bag usually lasts a single cat a whole month! As an added bonus, World’s Best Cat Litter™ is planet friendly! It’s 100% natural, made from sustainably grown corn (not mined clay), and it’s biodegradable so it won’t spend eternity in a landfill. So do yourself, your cat, and the planet a favor and make over that litter box! I’ve got a cat-tastic giveaway of my own going on! You could win a six-month supply of World’s Best Cat Litter™! Just visit the giveaway page on the PetLiving website and enter before 11:59 a.m. ET on September 1 to pounce on your chance to take home the prize!